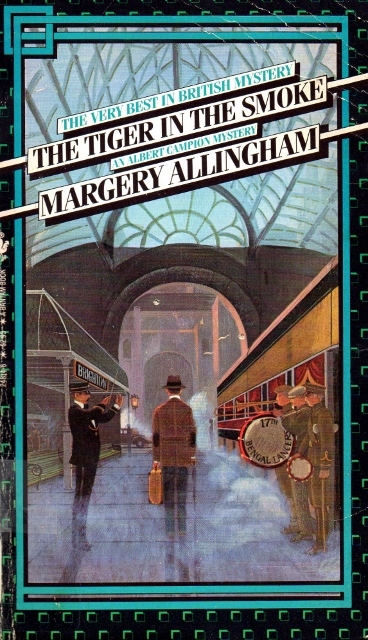 I think I’ve reached the apex of Margery Allingham’s series of novels about detective/adventurer Albert Campion. Published in 1952, the 14th Campion novel, The Tiger in the Smoke, brings us a Campion who is a husband and a father. He still sometimes puts on that mask of dim-witted affability, but on the whole, he’s a more serious man than the one from the first books. In this book, he’s called upon to help a young war widow, Meg Elginbrodde, who, as she prepares to remarry, begins receiving photographs in the mail that appear to be of her husband, Martin, who was presumed dead in World War II. Set against a backdrop of fog-engulfed London, the mystery that unfolds leads to a bloody triple murder, a kidnapping, and a prison escape by a man named Jack Havoc, who the police inspector handling the case believes to be the most evil man he’s ever encountered. The first thing that struck me about this book is how evocative Allingham’s descriptions of the city are. It’s a cold, dark, place, with fog covering it like mourning clothes, as the city grieves the many losses of war. The fog, with its ability to hide killers, kidnappers, and corpses, makes everything feel sinister. As they waited, Mr. Campion reflected that the evil smell of fog is a smell of ashes grown cold under hoses, and he heard afresh the distinctive noise of the irritable, half-blinded city, the scream of brakes, the abuse of drivers, the fierce hiss of tyres on the road. Just above it, like an appropriate theme song, sounded the thumping of the street band. There was nothing of the dispirited drone here. It triumphed in the thick air, an almighty affront of a noise, importunate and vigorous. The knot of men who were playing were half in the gutter and half on the pavement. They were moving along steadily, as the law insists, and the rattle of their collecting boxes was as noisy as their tune. They were some little way away and it was not possible to distinguish individuals, but there was a ruthless urgency in their movements and the stream of foot passengers narrowed as it flowed past the bunch. The street band becomes important to the plot, and the way Allingham describes their music as insistently cutting through the fog—an almighty affront, suggesting both something divine and something offensive—makes me think of the way good and evil, justice and grace are juxtaposed in the book. Toward the end of the novel, a key character has to choose justice or grace in the face of great evil, and the results of the choice are ambiguous. Nearly, but not quite, disastrous. Perhaps saving the day, perhaps leading to ruin. There’s more than one way to read it. Like Campion himself, Allingham’s Campion novels have gotten more serious. This book in particular has a lot on its mind, but it raises questions, rather than answering them. As usual, we do learn who did it in the end, but that question isn’t the important one. Why did he do it? What makes a person evil? How should the good respond to the evil? How will evil respond in the face of goodness? I’ve seen this book at the top on lists of the best 20th century mysteries, and I do think it’s the best in the series. I love seeing Amanda again! Yes, I always want more Amanda! And I loved their son and his worry about the hairs on poor Lugg’s head being numbered. I have a couple of the early books in this series, though I do not think I have the first. This review makes me want to read the series in order! I love when mysteries focus on the growth of the detective. Campion’s growth isn’t really a focus, but you can definitely see it happen if you read in order. I think, too, Allingham grows as a writer and tries new things as she goes along. I’m slowly re-reading the Campion novels in order. This one sounds great. I look forward to it. This is my first time reading most of them, but I’ve been reading them in order. This is definitely my favorite so far. 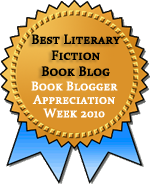 This books seems to be quite popular with fans of thrillers,but I have heard of it only recently! I think there must be something accounting for its popularity.Is a really really good book? If you like classic Golden Age mysteries, then yes, it is very good. It doesn’t quite work as a whodunit (Allingham’s books rarely do), but it’s got some great moments and wonderful characters. This is the first Campion I read, and still the only one, as I found it so over-dramatic. But, never fear!, I am prepared to try again, because I should love anything crime-y from this era: I am thinking of trying The Fashion in Shrouds – what do you think? Hmm… Fashion in Shrouds is a tough one. I found it fascinating but mostly in a relic-of-its time way. I had a lot of problems with the view of women that seemed to dominate the book, and Campion says some things that are downright horrible. But there’s some great stuff in it, too, especially when it comes to Amanda. However, it’s maybe not the best avenue into Campion. I’d suggest Sweet Danger, Look to the Lady, The Case of the Late Pig, or Traitor’s Purse as better choices. Oh, thank you — I am determined to persevere! But they are all three mysteries! Wonder if he was thinking of this book at all when he wrote the Lockhart books.